Sea Ray 1401344 Black 9 3/4 x 9 Inch Aluminum Boat 120 AC Volt Switch Panel. Boat part number 8501618 is a NEW, out of the box, switch panel from Sea Ray, part number 1401344. This panel is constructed from black powder coated aluminum and has white lettering / numerals. The panel measures approximately 9 3/4" L x 9" W x 4" D overall and has (4) 3/16" mounting holes set apart 9 1/8" x 8 3/8" center on center. This panel features a dual electrical outlet with reset / test buttons. There are 2 rocker switches; One for the outlet and one for the battery charger. Both switches are ON / Momentary ON / OFF. The accy has a blank switch cover plate in its place. There is a TEST and RESET GFP-Ground Fault Sensing module which has a black TEST button and a red RESET button. There are (2) lights on the panel as well: (1) Red- REVERSED POLARITY (1) Green- POWER. 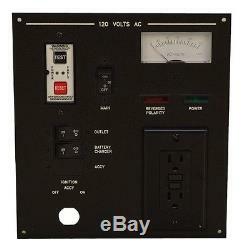 The AC Volt meter ranges from 0-150 RMS. There is also a main power switch that has an ON / Momentary ON / OFF. There is also a cutout measuring approximately 7/8 diameter for an ignition switch. Overall Dimension: 9 3/4" L x 9" W x 4 D. Mounts: (4) 3/16" mounting holes set apart 9 1/8" x 8 3/8 center on center. Customers please note every computer shows colors differently. Hardware and instruction / installation manual not included. You may also reach us using the Ask a Question link at the top of the page. Feel free to send us a message any time! 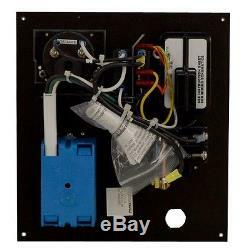 The item "Sea Ray 1401344 Black 9 3/4 x 9 Inch Aluminum Boat 120 AC Volt Switch Panel" is in sale since Monday, December 28, 2015. This item is in the category "eBay Motors\Parts & Accessories\Boat Parts\Electrical & Lighting". The seller is "greatlakesskipper" and is located in Racine, Wisconsin. This item can be shipped to United States, Canada, United Kingdom, Denmark, Romania, Slovakia, Bulgaria, Czech republic, Finland, Latvia, Lithuania, Estonia, Australia, Greece, Portugal, Cyprus, Slovenia, Japan, China, Sweden, South Korea, Indonesia, Taiwan, Belgium, France, Hong Kong, Ireland, Netherlands, Poland, Spain, Italy, Germany, Austria, Israel, New Zealand, Philippines, Singapore, Switzerland, Norway, Saudi arabia, United arab emirates, Qatar, Kuwait, Bahrain, Croatia, Malaysia, Chile, Colombia, Costa rica, Panama, Trinidad and tobago, Guatemala, Honduras, Jamaica.